The Vulcan Undiplomatic Corp Bat'leth Martial Arts Team Welcomes You! WHAT IS the Vulcan Undiplomatic Corp? In early 2002 team member Jim Vance was running for the Libertarian Party's nomination for Governor, and team members Tiffany and Rob Rapplean were working on his campaign. 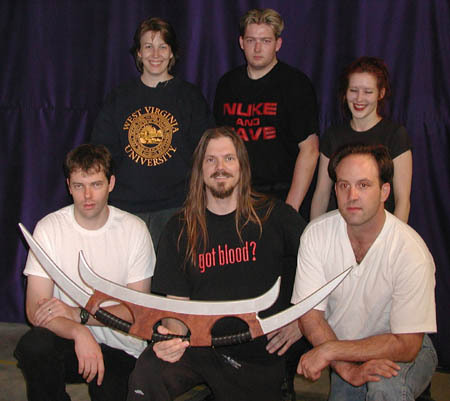 In an effort to draw attention to the campaign from one of its target markets, a Bat'leth team was created for the sole purpose of competing in an April tournamet in Denver. after a marathon battle for ranking. Jim didn't get the nomination, but the batleth team survived to become the Vulcan Undiplomatic Corp. If you're looking for an education in Klingon culture, then you probably want to visit House Veska's website where they have plenty of that kind of information. We completely ignore the Klingon cultural side of Batl'eth and concentrate on the miriad ways that you can hold or swing the weapon to "injure" your opponent or protect yourself. 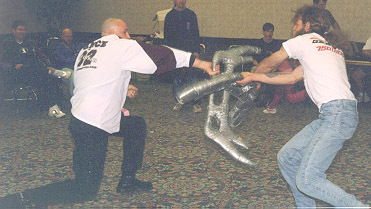 Our current techniques are based on our member's knowledge of jo-jitsu, kendo, kinjitsu, and nunchaku, and we have begun to develop several distinctive styles of our own. 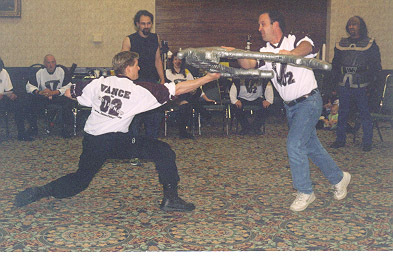 The team's expressed purpose is to turn Bat'leth into a true martial art all its own. Our team meets every Wednesday night at Rapplean Studios. Guests are welcome, but should contact Rob in advance for confirmation and directions. Our regime consists of an hour and a half of warm ups, competition, and practice drills. (Jim broke only one of these during ladder competitions)! We stress ego-free commentary and critical analysis of style. It is assumed that this is mostly new territory, and any advance in the art is both given an opportunity to succeed and criticized heavily to help it improve, but equally important despite being a new martial art discipline we strive to also HAVE FUN! 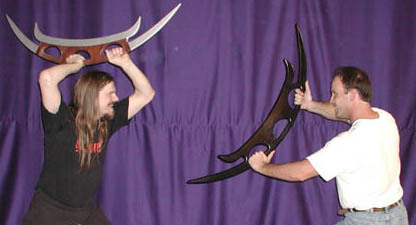 Would you like to see a demonstration of our Bat'leth Martial Art? Or Join in our training as a member of the Vulcan Undiplomatic Corp? Click HERE to inquire about joining, or HERE for further discussions. All content herin is copyright © 2002 and beyond to the founders and members of the "Vulcan Undiplomatic Corp"